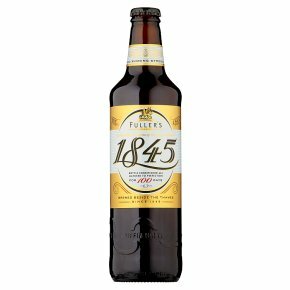 In 1995, to commemorate their 150th anniversary, Fuller's commissioned a special, celebration bottle-conditioned ale. Bottle-conditioning leaves a residue of yeast to ferment in the bottle, developing depth of flavour over time; 1845 is matured for at least 100 days. Well-rounded, with ripe fruit flavours. Award winning strong ale. Celebrating 150 years of brewing excellence. Brewed beside the Thames. Matured to perfection for 100 days.First brewed in 1995 to commemorate the 150th Anniversary of Fuller, Smith & Turner, this bottle conditioned recipe is inspired by the original Fuller's brewing books. The Amber malt and Goldings hops combine to create a delicious fruitcake aroma. As this beer is bottle conditioned, we recommend it is stored upright and poured carefully.